Heaven for a garlic lover. Playground for a child. Great sales for a shopper. Exploratorium for an art junkie. Part of what makes the city of Gilroy so remarkable is that all of these fun spots are located so close to each other. So quit worrying about navigation and time, and take a look at our top 10 options to make sure you don’t miss out on all the adventure before your trip to the garlic city! You will never really know how much can be done with garlic until you pay a visit to The Garlic Shoppe and Garlic World. These stores have everything garlic-related, and then some. Minced, roasted, crushed, chopped, you name it. The garlic hummus you get at your local supermarket is no match to the delicious variety of sauces available in these stores completely devoted to garlic. The Garlic Shoppe reflects a humorous vibe, sporting hilarious bumper stickers, peculiarly named items, and even garlic ice cream, which is a must-try. The free restrooms and roadside locations make them convenient rest stops during road trips as well. Entertainment. Pictures. Arts and Crafts. Wine. Garlic. Put all of these together, and you get the 38th annual Gilroy Garlic Festival from July 29th to July 31st. You can also meet the 2016 Miss Gilroy Garlic Festival Queen and take pictures with a life-sized garlic bulb named Gillie. Trade in your flower-crowns for garlic-laden headpieces, bask in the sun, and have a great time with the family. Over 80 arts and crafts activities as well as a children’s area is provided, making it a wonderful playground for your little ones as you sit back, drink some wine, and enjoy the music. Guaranteed fun for all ages – no promises on the smell, though. Curious to know why garlic is such a big deal in Gilroy? Interested in learning more about the community’s early traditions? The Gilroy Museum is a perfect place to stop and take in the city’s history. Each month, exhibitions and programs are held to promote cultural and historical awareness regarding Gilroy’s Mexican Family History. Traveling Trunks brimming with artifacts, replicas, and themes of the 1890s and the Ohlone Indians are available for free once a reservation is made. This museum is a mandatory stop for any history addict; you’re never too young or old to learn about the “garlic renaissance”! Is the word “garlic” starting to sound weird? The golf courts in Gilroy help prove that there is so much more to do in this city than celebrate your love for the spice. The Eagle Ridge Golf Club, is the most popular public golf course in the city, taking reservations up to 30 days in advance and even hosting various events and tournaments. It is made up of 18 holes and 3 lakes overall, along with a laid-back bar with a nice drinks selection. Starting in May and running all the way through October each year, the Gilroy Farmers Market guarantees the best quality organic produce, and can easily become a weekly activity. The atmosphere can make waking up on a Saturday morning completely worth it, and even if you aren’t planning on spending any money, the free samples given by the generous vendors can easily fill you up! The authenticity of the market, holding everything from purple cauliflower to spicy bee pollen, will definitely surprise you with something new during each visit. Gilroy Premium Outlets is a unique blend of a convenient location, wide variety of stores, and affordable deals. Located right next to the freeway US-101 and spread into different buildings, this outlet mall has everything from In-n-Out to Guess. Rather than having to resort to walk through the entire mall for the two stores you wanted to visit, the separated buildings assure that a quick drive through the parking lot is all it takes. The stores are filled with generous discounts, popularizing the spot. The only preparation you will need to make before your outdoor shopping spree is a weather check. 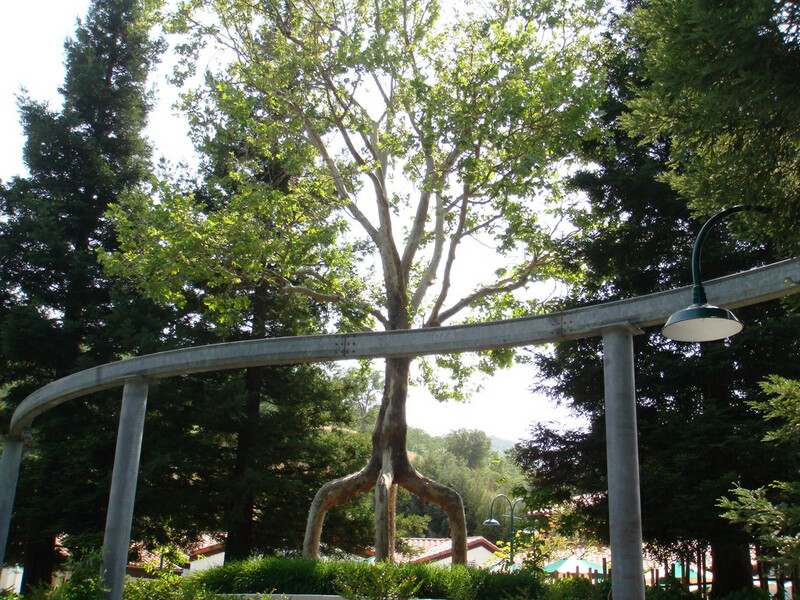 The Gilroy Gardens Family Theme Park is one of the most popular attractions in the city. With everything from playgrounds and rock mazes to rides for all ages, this amusement park is the perfect option for a well-spent family day. Featuring six gardens laden with rainbow-colored flowers and stunning backdrops, the garden provides multiple photo opportunities. Unlike many others, this park is also centered around learning, hosting various education programs for children. The dining and dessert options are a great way to unwind and end an eventful day in the gardens, open annually from May to November. The first annual Lumination festival is taking place starting the evening of July 16th and will last through November 27th. It will be a spectacular light festival celebrating 2,000 years of Chinese culture and traditions with different statues and sculptures. Located throughout the 26 acres of the Gilroy Gardens Family Theme Park, the festival will contain skilled reproductions of historic landmarks such as the Great Wall of China and the 60 foot tall Temple of Heaven. Hand-crafted pieces and lanterns will adorn the theme park, adding even more community and cultural significance to Gilroy. With a park membership comes free admission! If you’re a thespian or an art junkie who loves a smaller community or is looking to discover something new, the Gilroy Arts Alliance is a definite addition to your agenda. The Limelight Actors Theater offers five quality shows a year, with each show being a “Bring Your Own” Dinner & Wine experience. The center offers impressionist paintings, youth art classes, and wine strolls. All of the art gallery exhibits are updated every six weeks, as well as the Family Movie Night on the Green. Gilroy’s pleasant weather and outdoorsy feel makes it a favored location for parks and picnics. The city has a total of 18 parks, including the Gilroy Yamato Hot Springs which hosts guided tours and family activities. The Las Animas Veterans Park is also a popular destination, consisting of large trails, public BBQ areas, basketball/baseball courts, and skateboarding ramps. The little ones will enjoy the Wheeler Tot Lot, which holds play equipment and has a tiny tots play area. Each park is fairly spread out, placing them all at appropriate locations throughout the city.